step 1 Cream butter in a mixing bowl. step 2 Gradually add sugar (1/2 cup) and salt. step 3 Continue creaming until light and fluffy. step 4 Add nuts and vanilla extract. step 5 Blend in flour gradually. Mix thoroughly. step 6 Shape into teaspoonful balls. step 7 Place on ungreased cookie sheet. step 8 Bake at 325° F. for 15-20 minutes. step 9 Sprinkle some of the confectioner's sugar over cookies while still on the sheet. Cool before removing from cookie sheet. 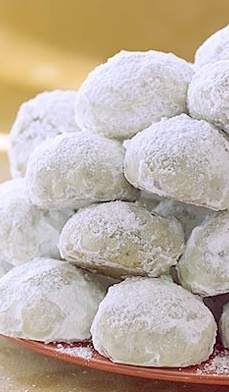 step 10 Place some confectioner's sugar in a Ziploc® Brand Storage Bag and place some of the cookies inside. Gently shake well so the sugar completely coats the cookies. These cookies taste best after sitting a couple of days. You can store them in the refrigerator, freezer, or at room temperature.